ing quickly developed into one of the top middle distance prospects in the country, running 3:56 for 1500m. The result was good enough to secure Wheating a spot on the fall roster of the re-surging track and cross country teams of the University of Oregon. At Oregon, Wheating continued to improve in leaps and bounds. As a sophomore, Wheating made history when he ran his first sub-four minute mile, 3:58.16, becoming the first Vermont native in history to break the four-minute barrier. 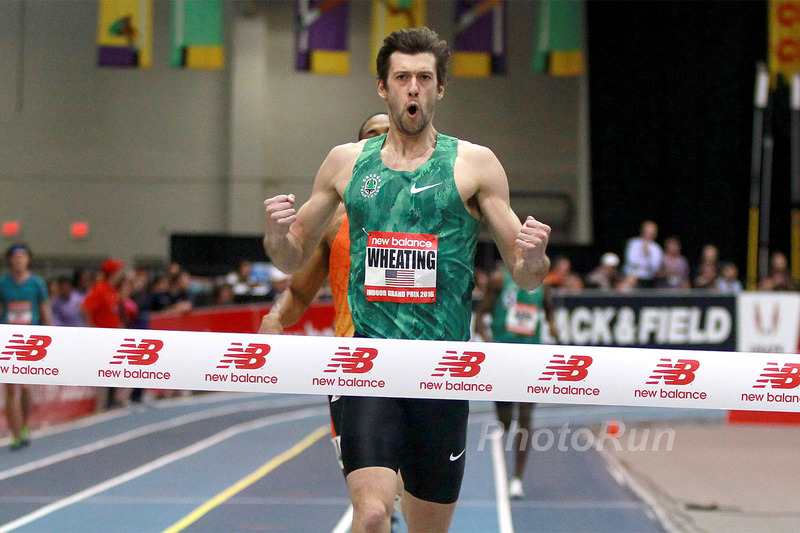 After finishing second in the 800m at the NCAA Championships later that year, Wheating, roared on by the rapturous fans at Hayward Field, repeated the finish in a thrill- ing 800m Olympic Trials final to qualify for his first Olympic Games. Returning to Oregon as an Olympian, Wheating repeated as PAC-10 and NCAA Outdoor Champion at 800m in 2009, but an injury sustained at the end of the latter race curtailed any hopes of making the World Chamionship team that summer. At the 2010 NCAA Championships, Wheating won the 800m handily before returning the next day to lead take 1500m as well, becoming the first man to win the two since Olympic Champion Joaquim Cruz. Not dissimilar to Cruz, Wheating is proving to have the talent and mettle that could one day land him on the podium at the highest levels of the sport.